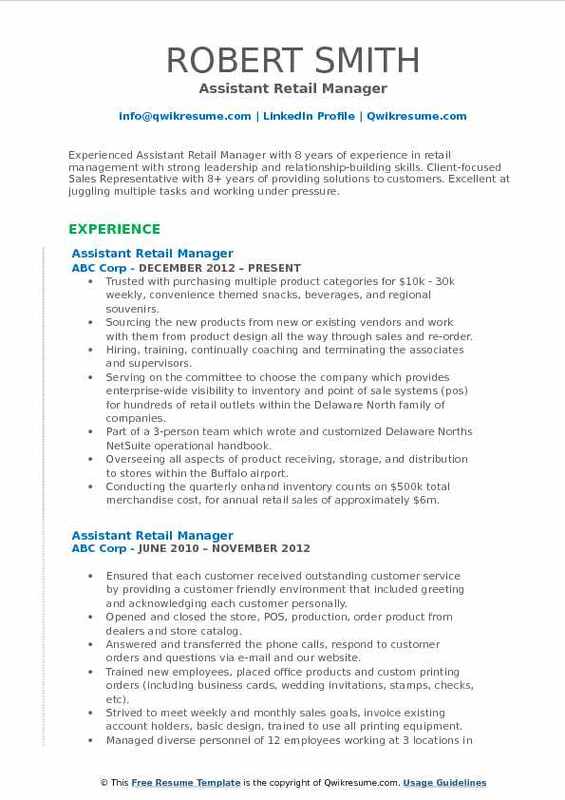 Assistant Retail Manager renders operational and administrative support to the Retail managers. 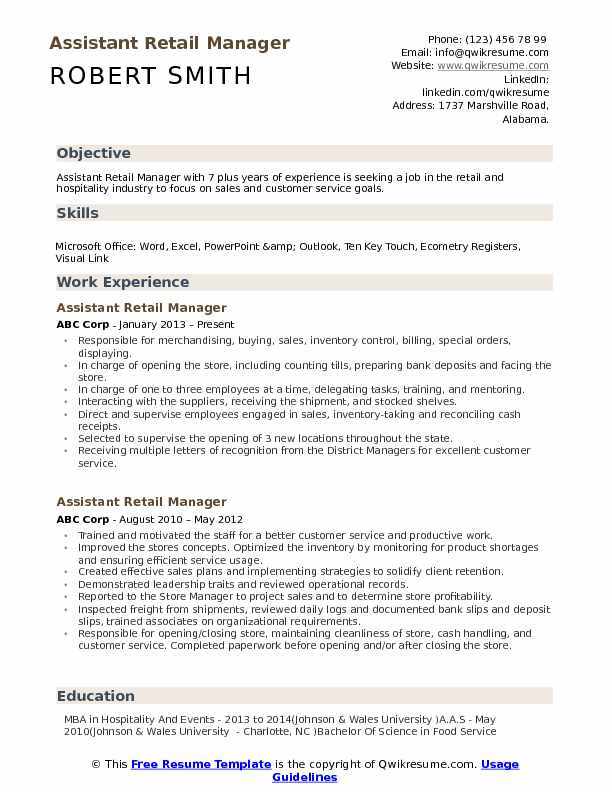 The job description that can be typically seen on the Assistant Retail Manager Resume includes – overseeing or monitoring sales activity, solving customers complaints, assigning work tasks, scheduling shifts, attaining sales targets, supervising and guiding staff, inspecting store areas, planning and overseeing promotional activities, ensuring safe and security guidelines in the store. 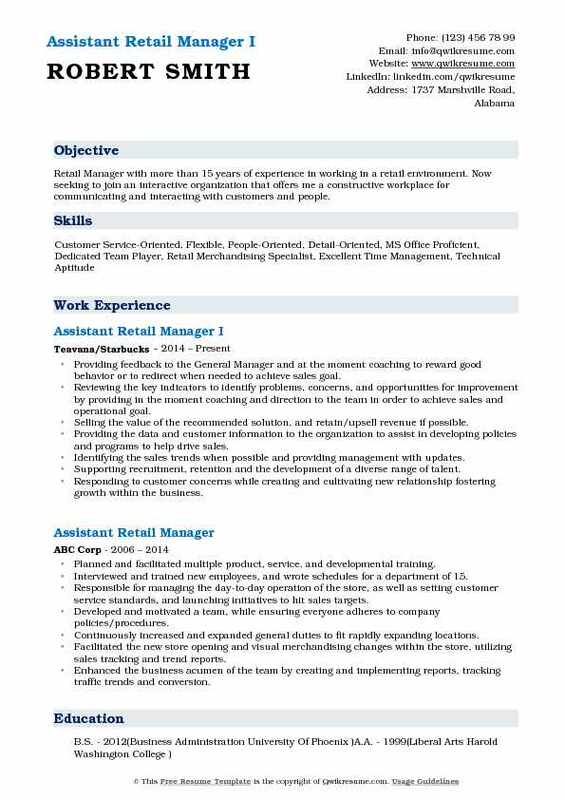 Candidates looking forward to making a career as an assistant retail manager should be able to focus on sales expertise, observation spirit, the ability to solve problems, time management, and computer competencies. They should also be possessing excellent leadership qualities and have good knowledge of retail management principles and retail management software. 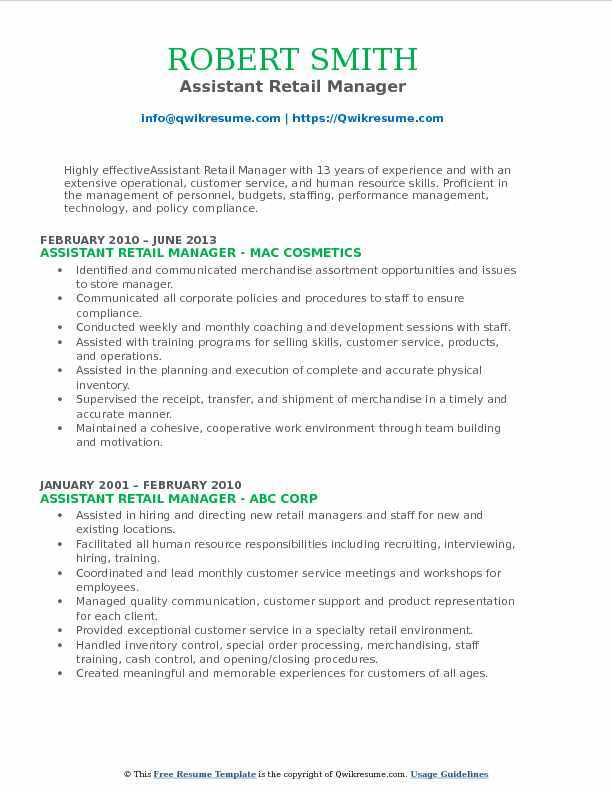 The most eligible resumes mention a high school diploma with retail management training as the education background. Summary : Assistant Retail Manager with 7 plus years of experience is seeking a job in the retail and hospitality industry to focus on sales and customer service goals. Responsible for merchandising, buying, sales, inventory control, billing, special orders, displaying. In charge of opening the store, including counting tills, preparing bank deposits and facing the store. In charge of one to three employees at a time, delegating tasks, training, and mentoring. Interacting with the suppliers, receiving the shipment, and stocked shelves. Direct and supervise employees engaged in sales, inventory-taking and reconciling cash receipts. Selected to supervise the opening of 3 new locations throughout the state. Receiving multiple letters of recognition from the District Managers for excellent customer service. Improved store concepts by implementing new products and creating a cozy modern atmosphere. Reducing the operation cost by creating an efficient schedule. 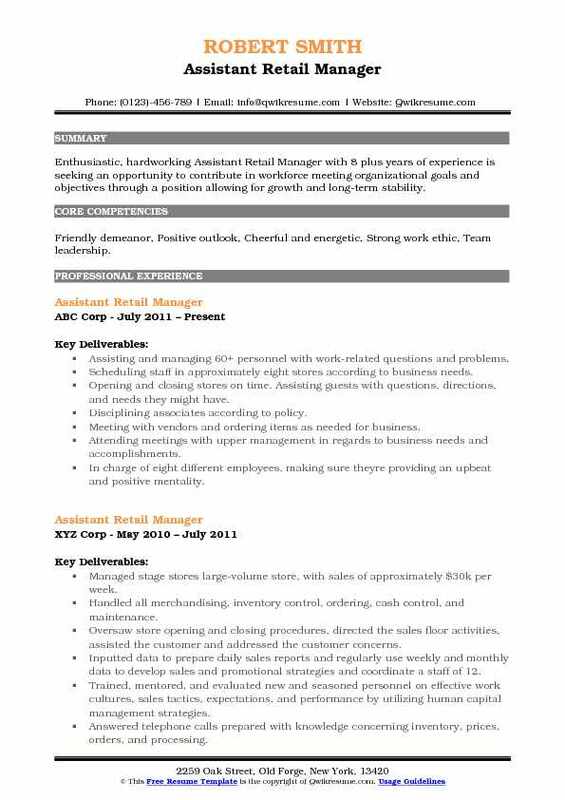 Objective : Assistant Retail Manager with 4 plus years of experience in the Retail domain. Excellence in assisting management operations, including scheduling, training, and control. Operates according to established procedures and standards. Assisting in overseeing the staff during daily operations of all retail locations to ensure adherence to the company and department policies and procedures by all staff. Helping the customer make selections by building customer confidence. Offering suggestions and opinions. Assisting the Manager with HR functions such as: recruiting, selecting, orienting, scheduling and training employees. Also, coaching, counseling, and disciplining employees. Responsible for maintaining inventories of merchandise, verifying deliveries. Assisting the manager with price setting, merchandise tag printing tags merchandise according. Assisting in training of staff according to the policies outlined in employee and department handbooks. This includes pos training, rules and regulations, and department procedures. Recording sales data, invoices, inventory numbers and purchase orders through the point of sale. Handling accounts receivables and payables through NetSuite programs. Performing daily management functions to ensure proper cash handling and cash accounting. Objective : Seasoned, results-producing management and Assistant Retail Manager with 3 years of experience with extensive experience leading profit-generating operations through innovative merchandising, pricing and discounting, and focus on continuous product turnover. Worked closely with other retail and distribution locations for shipment related requirements. Provided great leadership skills with the ability to multi-task while providing excellent people skills. Communicated effectively with staff and managers in an effort to maintain superior store environment. Responsible for handling incoming issues regarding incoming shipment orders. Assisted customers by providing product information while providing courteous service. Recruited, trained, developed and communicated with all staff as well as asses their performance on a regular basis. Planned and assigned daily goals, tasks, and assignments. Assured proper and complete thorough follow-up. Developed on-going professional relationships within Ricky's organization such as other locations and warehouses. Management of all office tasks, including management of funds and media, receiving, inventory and payroll. Helped manager to identify training needs of individual team members and address them accordingly. Summary : Experienced Assistant Retail Manager with 8 years of experience in retail management with strong leadership and relationship-building skills. Client-focused Sales Representative with 8+ years of providing solutions to customers. Excellent at juggling multiple tasks and working under pressure. Trusted with purchasing multiple product categories for $10k - 30k weekly, convenience themed snacks, beverages, and regional souvenirs. Sourcing the new products from new or existing vendors and work with them from product design all the way through sales and re-order. Hiring, training, continually coaching and terminating the associates and supervisors. Serving on the committee to choose the company which provides enterprise-wide visibility to inventory and point of sale systems (pos) for hundreds of retail outlets within the Delaware North family of companies. Part of a 3-person team which wrote and customized Delaware North's NetSuite operational handbook. Overseeing all aspects of product receiving, storage, and distribution to stores within the Buffalo airport. Conducting the quarterly onhand inventory counts on $500k total merchandise cost, for annual retail sales of approximately $6m. Creating, conducting, and evaluating the cycle counts to ensure accurate inventory. Objective : Experienced Assistant Retail Manager with proven ability to drive results in a high-volume environment in a multi-million dollar generating store, seeking a new position where I can utilize my relationship- and team-building skills. 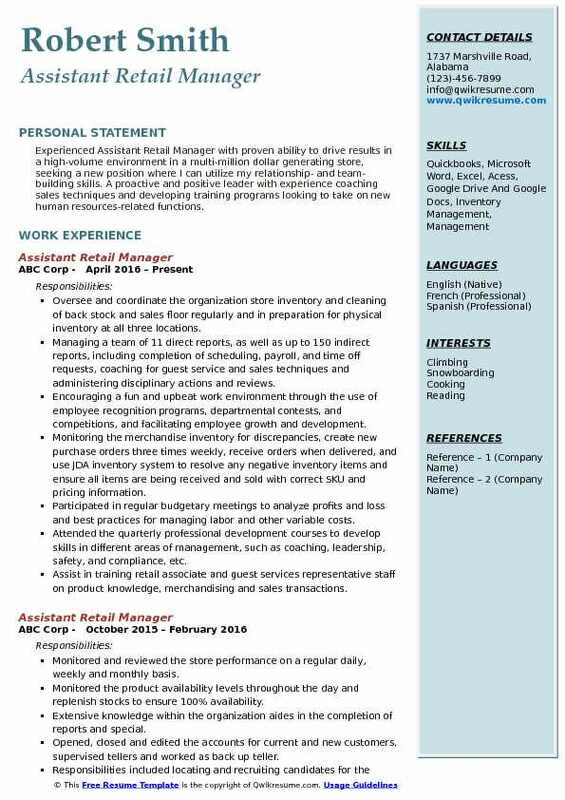 A proactive and positive leader with experience coaching sales techniques and developing training programs looking to take on new human resources-related functions. Oversee and coordinate the organization store inventory and cleaning of back stock and sales floor regularly and in preparation for physical inventory at all three locations. Managing a team of 11 direct reports, as well as up to 150 indirect reports, including completion of scheduling, payroll, and time off requests, coaching for guest service and sales techniques and administering disciplinary actions and reviews. Encouraging a fun and upbeat work environment through the use of employee recognition programs, departmental contests, and competitions, and facilitating employee growth and development. Monitoring the merchandise inventory for discrepancies, create new purchase orders three times weekly, receive orders when delivered, and use JDA inventory system to resolve any negative inventory items and ensure all items are being received and sold with correct SKU and pricing information. Participated in regular budgetary meetings to analyze profits and loss and best practices for managing labor and other variable costs. Attended the quarterly professional development courses to develop skills in different areas of management, such as coaching, leadership, safety, and compliance, etc. Assist in training retail associate and guest services representative staff on product knowledge, merchandising and sales transactions. 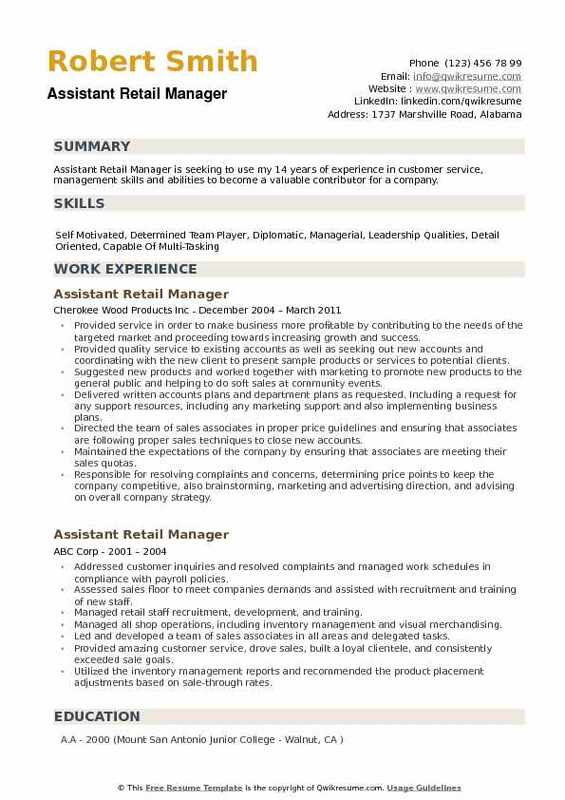 Summary : Retail Manager with more than 15 years of experience in working in a retail environment. Now seeking to join an interactive organization that offers me a constructive workplace for communicating and interacting with customers and people. Providing feedback to the General Manager and at the moment coaching to reward good behavior or to redirect when needed to achieve sales goal. Reviewing the key indicators to identify problems, concerns, and opportunities for improvement by providing in the moment coaching and direction to the team in order to achieve sales and operational goal. Selling the value of the recommended solution, and retain/upsell revenue if possible. Providing the data and customer information to the organization to assist in developing policies and programs to help drive sales. Identifying the sales trends when possible and providing management with updates. Supporting recruitment, retention and the development of a diverse range of talent. Responding to customer concerns while creating and cultivating new relationship fostering growth within the business. Adhering to daily metrics and company policies, maintaining operational expenses while driving revenue. Ordering and maintaining the inventory on all products purchased for consumer and business needs. Summary : Highly effectiveAssistant Retail Manager with 13 years of experience and with an extensive operational, customer service, and human resource skills. Proficient in the management of personnel, budgets, staffing, performance management, technology, and policy compliance. Identified and communicated merchandise assortment opportunities and issues to store manager. Communicated all corporate policies and procedures to staff to ensure compliance. Conducted weekly and monthly coaching and development sessions with staff. Assisted with training programs for selling skills, customer service, products, and operations. Assisted in the planning and execution of complete and accurate physical inventory. Supervised the receipt, transfer, and shipment of merchandise in a timely and accurate manner. Maintained a cohesive, cooperative work environment through team building and motivation. 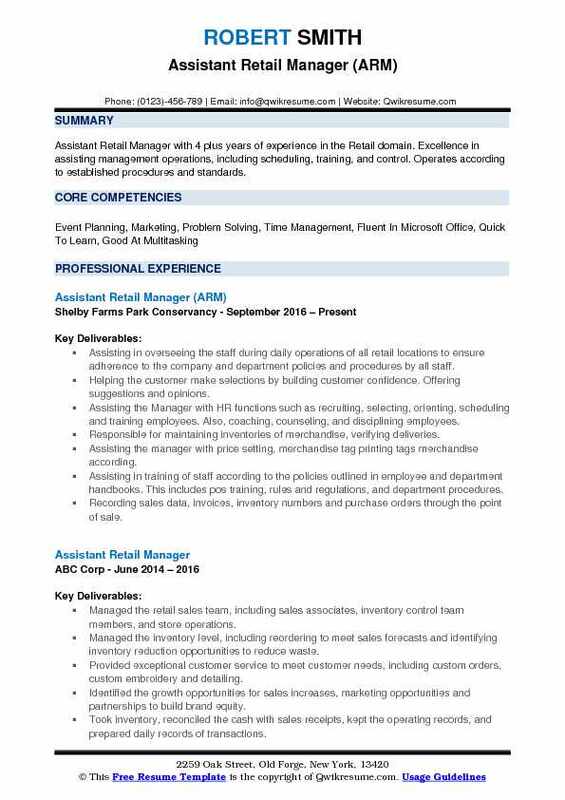 Responsible for daily operations within a high volume retail store while maintaining a high quality of customer service. Drove and oversaw overall business by developing staff, outsourcing, networking and motivating. Oversaw all aspects of operations including staffing, hours of operation, trends, establishing plans based on the current business. Summary : Enthusiastic, hardworking Assistant Retail Manager with 8 plus years of experience is seeking an opportunity to contribute in workforce meeting organizational goals and objectives through a position allowing for growth and long-term stability. Skills : Friendly demeanor, Positive outlook, Cheerful and energetic, Strong work ethic, Team leadership. Assisting and managing 60+ personnel with work-related questions and problems. Scheduling staff in approximately eight stores according to business needs. Opening and closing stores on time. Assisting guests with questions, directions, and needs they might have. Disciplining associates according to policy. Meeting with vendors and ordering items as needed for business. Attending meetings with upper management in regards to business needs and accomplishments. In charge of eight different employees, making sure they're providing an upbeat and positive mentality. Relying on daily customer service, retaining our current customers for future years to come. Assisting the walk-in customers with their purchases and educate customers for large volume orders. Completing daily private restaurant orders and calculate bills/invoices associated with each account. Achieving the personal sales and KPI goals while maintaining staff accountability, customer experience, and all store operations. 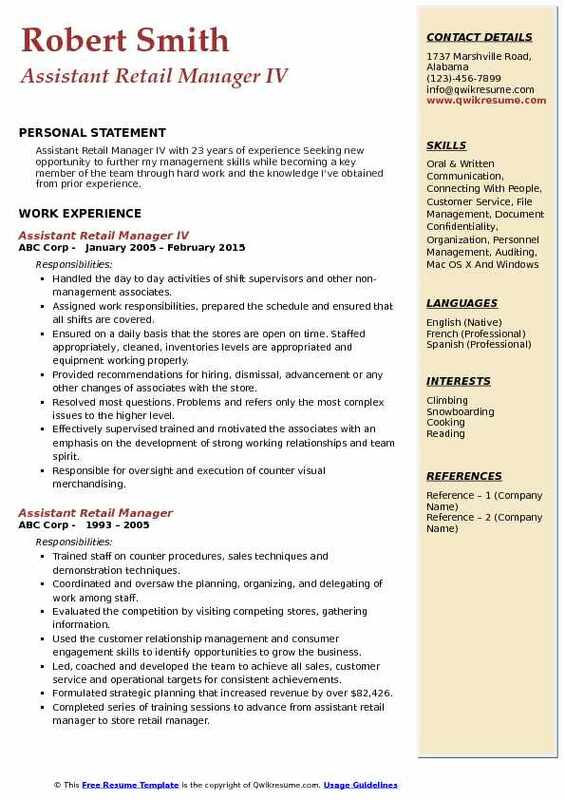 Summary : Assistant Retail Manager IV with 23 years of experience Seeking new opportunity to further my management skills while becoming a key member of the team through hard work and the knowledge I've obtained from prior experience. Handled the day to day activities of shift supervisors and other non- management associates. Assigned work responsibilities, prepared the schedule and ensured that all shifts are covered. Ensured on a daily basis that the stores are open on time. Staffed appropriately, cleaned, inventories levels are appropriated and equipment working properly. Provided recommendations for hiring, dismissal, advancement or any other changes of associates with the store. Resolved most questions. Problems and refers only the most complex issues to the higher level. Effectively supervised trained and motivated the associates with an emphasis on the development of strong working relationships and team spirit. Responsible for oversight and execution of counter visual merchandising. Responsible for creating and updating revenue calendar, weekly staffing schedule, ordering office supplies, and creating teambuilding events. Maintained professional and technical knowledge by attending educational workshops, and training the employee. 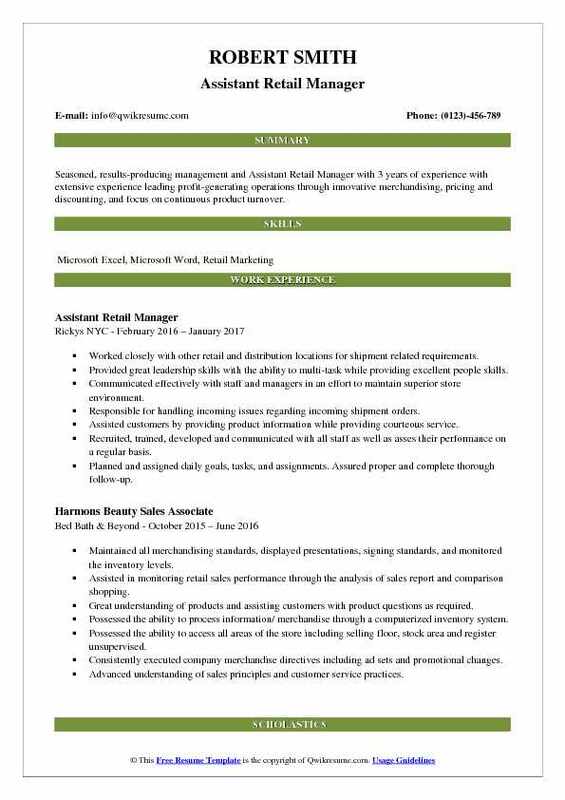 Summary : Assistant Retail Manager is seeking to use my 14 years of experience in customer service, management skills and abilities to become a valuable contributor for a company. Provided service in order to make business more profitable by contributing to the needs of the targeted market and proceeding towards increasing growth and success. Provided quality service to existing accounts as well as seeking out new accounts and coordinating with the new client to present sample products or services to potential clients. Suggested new products and worked together with marketing to promote new products to the general public and helping to do soft sales at community events. Delivered written accounts plans and department plans as requested. Including a request for any support resources, including any marketing support and also implementing business plans. Directed the team of sales associates in proper price guidelines and ensuring that associates are following proper sales techniques to close new accounts. Maintained the expectations of the company by ensuring that associates are meeting their sales quotas. Responsible for resolving complaints and concerns, determining price points to keep the company competitive, also brainstorming, marketing and advertising direction, and advising on overall company strategy. Developed and implemented social media marketing to increase publicity and improved revenue.